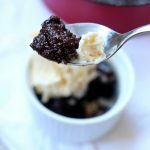 Instant Pot Warm Chocolate Melting Cake–chocolatey, rich, decadent cake that is more like a truffle or brownie batter than a cake. 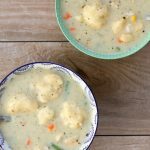 My version is made family-style instead of in individual ramekins and I used my Instant Pot to speed the process up a bit. I need my chocolate now, people. If you’ve ever been on a Carnival Cruise you’ll definitely know what a “warm chocolate melting cake” is. It’s on the dessert menu each night and it is a chocolate lovers dream. My family and I cruise a lot. It is how we love to vacation. We’ve been on 9 Carnival cruises and I’ve come to the point where I don’t even look at the dessert menu. I mean what is the point when I know that the best dessert ever is on there. Why would I even order anything else? The reason I love this dessert is because it is so rich and ultra chocolatey. That is how I roll. If you’re a “fruit for dessert” type of person, I don’t think you will like this dessert. If you’re the type person who likes to sneak spoonfuls of brownie batter while you feed your kids applesauce, then this cake is for you. 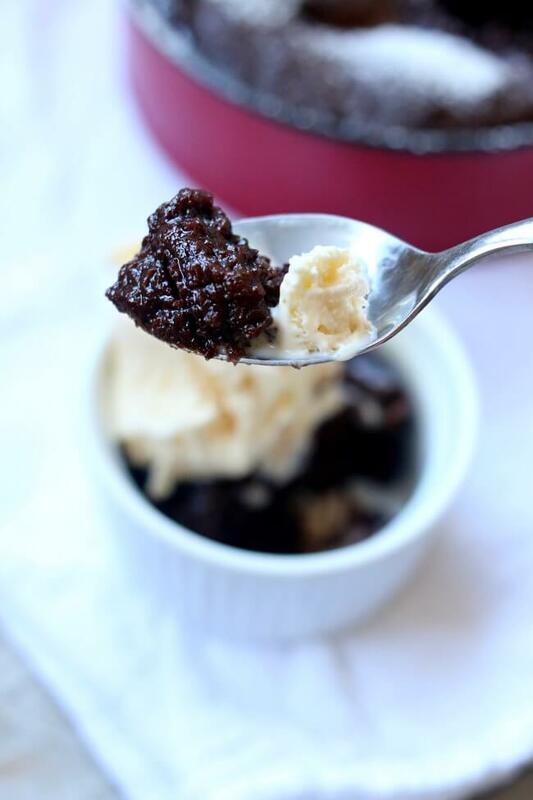 Traditionally warm chocolate melting cake is serve in individual ramekins with a little scoop of ice cream on the side. While I love the idea of individual desserts sometimes it’s just easier to make a dessert family-style instead. And sometimes you might not have any ramekins at your house. 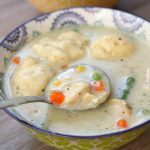 This one is cooked in a 7 inch spring form pan that will fit nicely into your Instant Pot. 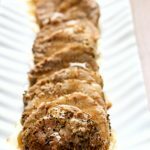 What equipment will I need to make this recipe? 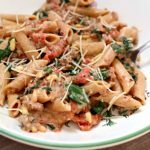 6 quart Instant Pot Duo 60 7 in 1 for this recipe. I also own the 6 quart Instant Pot IP-LUX60 V3 Programmable Electric Pressure Cooker. They are both great pressure cookers! The first one I mentioned has a yogurt making function but other than that they are fairly similar. The price difference between the two is about $20. A trivet to place the pan on. I used the trivet that came with my Instant Pot. Here is a similar type of trivet. 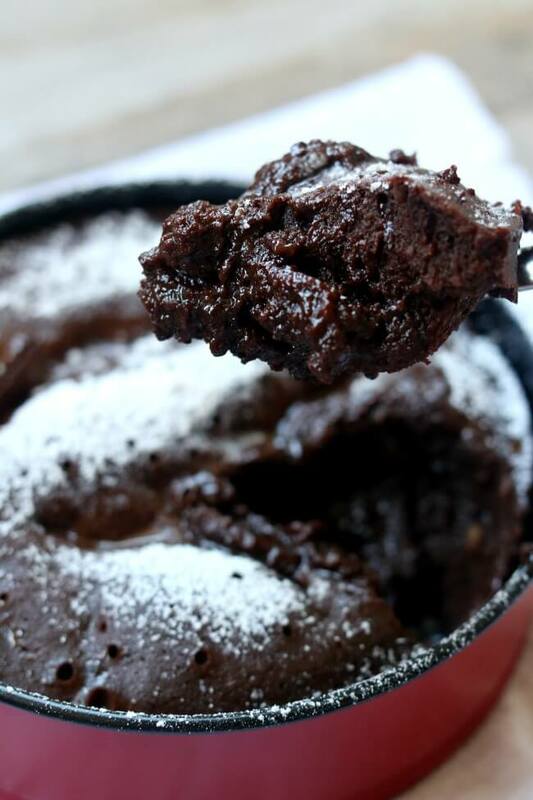 Chocolatey, rich, decadent cake that is more like a truffle or brownie batter than a cake. Melt the chocolate and butter in the microwave or on the stovetop. Stir until smooth. Set aside and let cool for 10 minutes. In a separate bowl, mix the vanilla and 4 eggs with sugar. Whisk. Then add the flour and salt and whisk. Add the remaining 3 eggs and whisk. Add the egg mixture to the chocolate mixture and stir together until incorporated. Spray your 7 inch spring form pan (or another oven safe dish/pan that fits nicely into your instant pot) with non-stick cooking spray. Pour the batter inside the pan. Cover the pan tightly with a piece of foil. This step is not necessary but it will keep the top of the cake from getting pools of moisture on top of it. 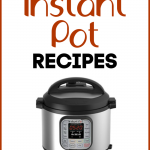 Pour 1 cup of water in the bottom of the Instant Pot. Place the pan evenly on top of the trivet. Lower the trivet down into the Instant Pot. 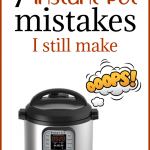 Cover the Instant Pot and set the timer on manual (high pressure) to 12 minutes. Make sure the valve is set to “sealing.” Let the pressure release naturally for 10 minutes and then move the valve to “venting.” remove the lid. Carefully remove the trivet and pan with oven mitts. Immediately serve this dessert. 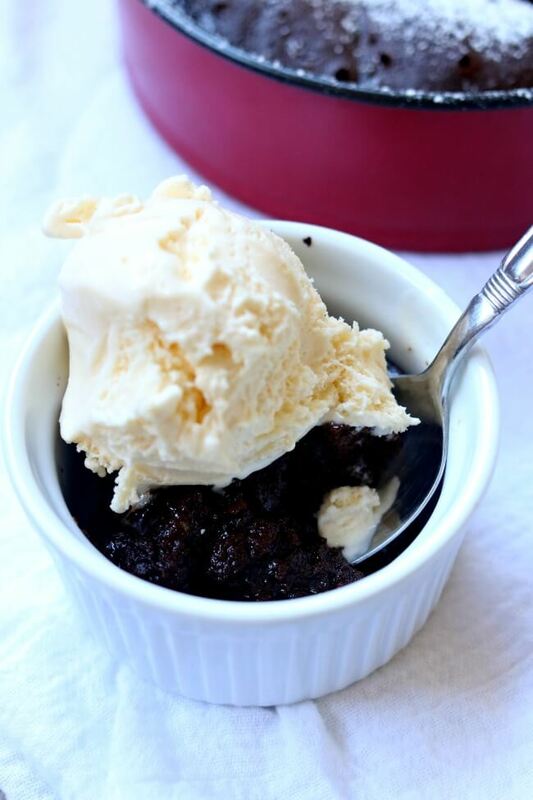 Using a spoon scoop down into the dessert and serve in individual bowls with a scoop of vanilla ice cream on top. The dessert will not be set in the middle. The cake should be cake-like and spongy on the top but the middle of the cake should be melty and gooey– the consistency of pudding, not too runny. You can also make this in the oven in 6 individual ramekins. Place batter in each ramekin and bake at 375 degrees F for 15-20 minutes.